January Journal: Day 20 — Ginger writes. This is why we memorize. Thank you, Ann Voskamp. We use our mouths to tell our hearts what to believe. I have been listening to several old podcasts by Andrew Pudewa lately. He's the brilliant teacher who wrote the IEW writing curriculum that we use for school. My soul has been nourished, even as I spend hours making nourishment for my family in the form of no-bake bars, chocolate chip/oatmeal loaf, breakfast cookies (we love our sweets for breakfast! ), and all the everyday dinners that just don't stop. I can't believe I waited this long to start listening to podcasts, but it has been such a great enrichment to my life in recent days. One of Pudewa's big ideas is that our goal should be to maintain the memorized repertoire. He was trained in the Suzuki method, which according to Wikipedia, "is an internationally known music curriculum & teaching philosophy dating from the mid-20th century, created by Japanese violinist and pedagogue Shinichi Suzuki." Pudewa explains how young Japanese musicians learn a piece on the violin and then never stop practicing it. They keep learning new pieces, all the while reviewing the old pieces. He says that the number of pieces a student may have in their repertoire after a few years is incredible, given the fact that all pieces are played from memory. Taking this idea of violin practice further, Pudewa applies it to memory work for the mind. Ideally, we and our children will memorize a Scripture passage, poem, speech, or the like, and never forget it. The only way to never forget it is to keep practicing. Pudewa talks about memory work being a combination of frequency (repetition), intensity (the power of the experience), and duration (persistence over time). I traded knife for pen to copy this quote while listening to Pudewa's podcast entitled "Nurturing Competent Communicators:"
The myth is that good readers automatically become good writers. The two truths are that #1) reading out loud to your children, and #2) having them memorize poetry, are the two most powerful ways to furnish their minds with reliably correct and sophisticated language patterns, thereby nurturing truly competent writers and thinkers. I love the idea of furnishing our children's minds and our own minds. I want to furnish my mind with good, true, and beautiful things so that I can live out of that goodness, truth, and beauty. That's obviously what I want for my children as well. By putting Scripture verses, poetry, speeches such as the Gettysburg Address, the words of documents such as The Declaration of Independence, and prayers such as the one I shared from The Valley of Vision earlier this week, we get the privilege of using our words to build a place for our hearts to thrive. Romans 12:2 talks about being "transformed by the renewing of your mind." That's my hope with Scripture memory in particular, that my mind will be made new. As I say the words of Psalm 90 over and over again, I remind myself to "number my days aright, that I may gain a heart of wisdom" (verse 12). As I say Philippians 2:3-11, my prayer is that I will "Do nothing out of selfish ambition or vain conceit, but in humility consider others better than yourselves." As I practice Philippians 4:6-7, I want to go from being anxious to "not be anxious about anything, but in everything, by prayer and petition, present your requests to God." 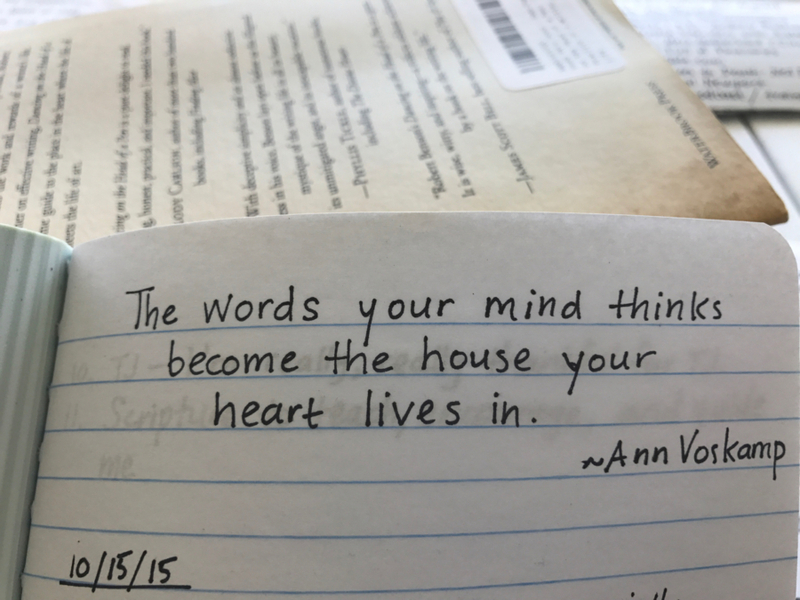 The words I say with my mouth and mull over in my mind are the things I begin to live into. Without the directives, it's more difficult to take aim or to let the Spirit work. I wrote down this simple line yesterday and stuck it on the fridge. Andrew Pudewa said his mom would tell him this about memory work. I would add on that getting the whole into your soul helps to make your soul whole. All that I've shared these past six days are simply an ideal for how to get the whole into your soul. We surely are not perfect when it comes to memory work at our house. There are times when I've been too dogmatic, too hard, or too harsh. There are times when the kids just conk out on me, or when mustering their cooperation is like rounding up a herd of monkeys. Some days I don't feel like saying my verses on my walks or in the shower or anywhere at all. My mind wanders and I just want to think about what I'm cooking for dinner or something my sister told me or when I can meet my friend Kristy at Tandem. Even so, I push on toward the goal of honoring that part of my soul that longs for goodness, truth, and beauty. Memory work helps me and I know it helps my children. Whether or not they realize it or even desire the benefits at this point in their young lives, I am convinced from my own experience that these good things we put in now will work their magic of bringing light into dark places, both in our hearts and in the world. Unless something is in us, it cannot come out. Go forth and plant the seeds of memory work. It takes time and persistence, including struggles and occasional bad attitudes. Pride in accomplishment, and fun in chanting the sing-song words of a silly poem are mixed in there too. Whatever happens, don't turn back. Say the words day after day, and let the words do their work. And then one day, something will come up out of the hearts that have been nurtured. Even your own heart and mind might surprise and delight you. There will be a season to reap the great rewards!